Inside an exquisite custom-built 150-plus-mph V-bottom. 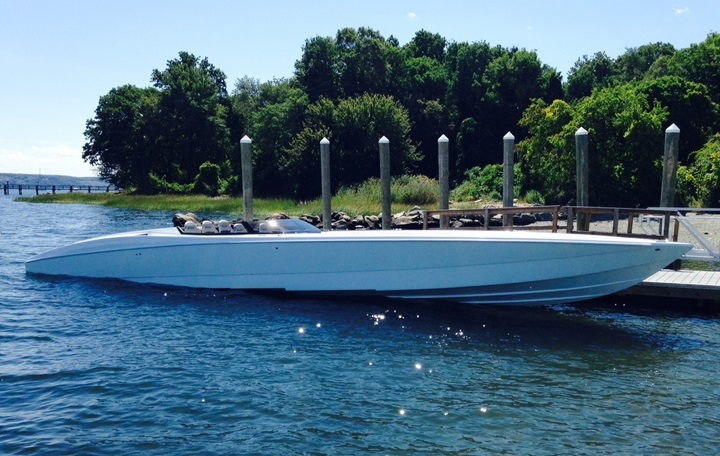 To date, Outerlimits Offshore Powerboats has built 13 SV 43 V-bottoms since the model was introduced in 2008. Now, a “baker’s dozen” of boats over the five years might not sound like a whole lot of production, but Outerlimits is a high-end custom builder of go-fast V-bottoms and catamarans from 29 to 52 feet. 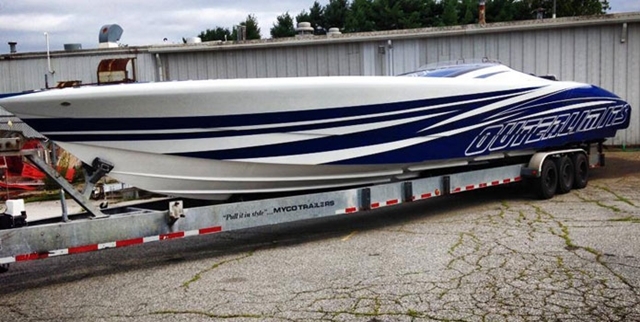 Dustin Whipple’s Outerlimits SV 43 is a one-of-a-kind aquatic rocket that can top 150 mph. All photos by Robert Brown. Prices start in the $300,000 range and can reach more than $1 million depending on desired power and options. The company builds 12 to 15 boats a year, so that one model has accounted for more than two boats a year since it was introduced is significant. The Bristol, R.I., company separates its V-bottoms into stand-up, dubbed “Super Leggera (SL),” and sit-down, called “Super Vee (SV),” cockpit categories. The SL models have deeper cockpit and taller decks, which make for larger cabin spaces, while the SV models have shallower cockpits and cut-down decks, which still allow for cabins—but with less headroom. From the moment Fiore and company unveiled the SV 43, I’ve been sweet on it. 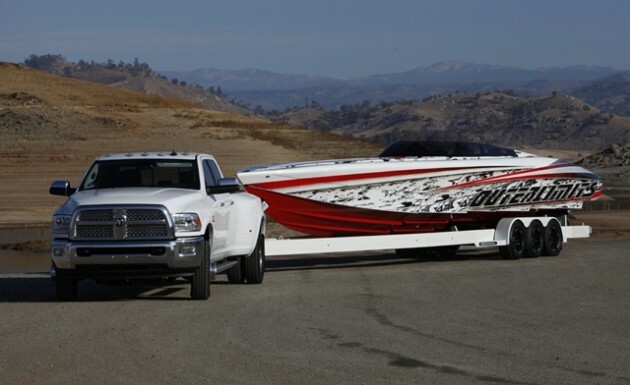 The 43-footer has, to my tastes, the sexiest lines of any go-fast V-bottom currently on the market. Outerlimits’ build quality and craftsmanship, which feature post-cured epoxy, carbon fiber, Kevlar and E-glass lay-ups, are as good as they get. As is the performance of the company’s V-bottom creations. A collaboration between Teague Custom Marine and Whipple Industries, prototype 1,385-hp supercharged engines—matched to the boat’s color scheme—power the 43-footer. But I didn’t get my first ride on an SV 43 until late last year when Fiore and Dustin Whipple of Whipple Superchargers in Fresno, Calif., invited me to join them for the third test session in Whipple’s new and completely tricked out SV 43. Almost two years in the making, the 43-footer proved to be work than a work of art with endless billet aluminum hardware, custom shock-absorbing bucket seats, and one-of-a-kind graphics created by No Coast Design in Elkhart, Ind. It is a 150-plus-mph rocket powered by a pair of staggered 1,385-hp prototype engines, the product of a collaboration between Whipple Industries and Teague Custom Marine in Valencia, Calif.
Teague Custom Marine built the lower halves of the 565-cubic-inch engines, including the oiling and water systems. “We are working on a version of this prototype motor that will be one of our next-generation offerings,” said Bob Teague, owner and founder of Teague Custom Marine. Teague shipped the completed long blocks to the Whipple facility and Dustin Whipple took it from there. 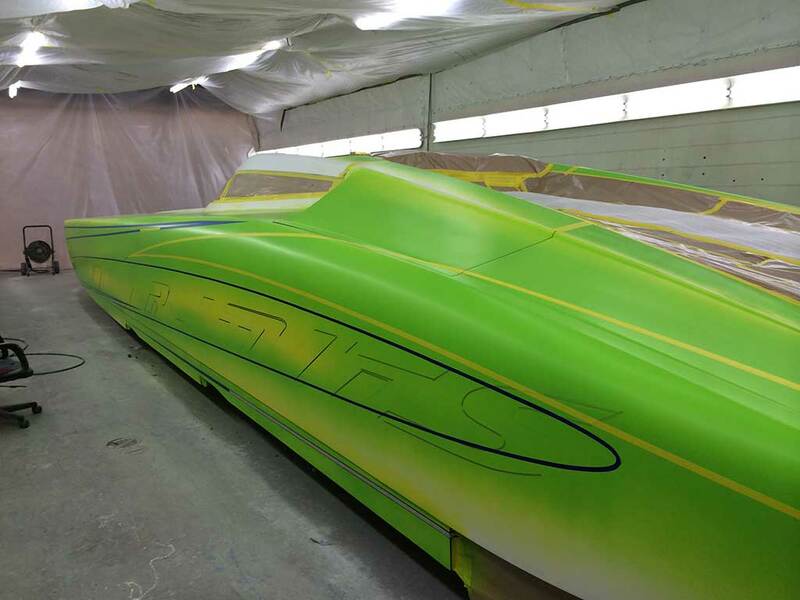 The boat’s outrageous graphics were designed by Thomas Kulesia, II, of No Coast Design. Whipple spent many hours computer-mapping the prototype engines, and reached his goal. In addition to an output of 1,385 hp, each engine produced 1,325 foot-pounds of torque—on pump gas. What’s more, he was able to map redundant measures of engine protection into their controllers. Once Whipple finished his work, he shipped the color-matched engines to Outerlimits, where the company rigged and installed them it in its typically impeccable fashion. So what was the SV 43 like on the waters of Millerton Lake outside Fresno? The word ballistic comes to mind. With the engines turning 5,000 rpm—meaning they had 2,000 rpm left in them—the 9,000-pound 43-footer cruised happily at 130 mph. 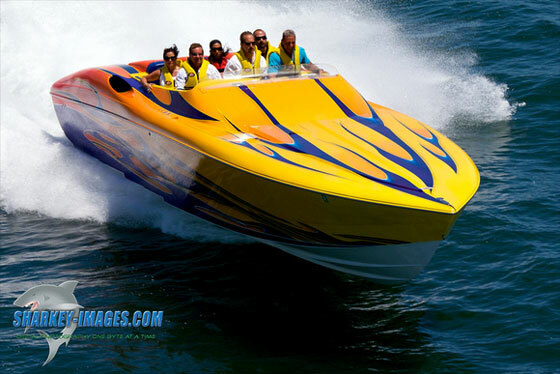 In a speed-doubling drill, the boat rocketed from 60 to 120 mph in 13.5 seconds. Shock absorbing buckets were specially fabricated for the boats’s sit-down cockpit. Whipple and Fiore did not run the boat to its top speed while I was on board, which was more than fine with me. But in subsequent test sessions, the SV 43 reportedly reached 152 mph, and based on my time in the boat—plus videos and photos of the 43-footer’s GPS reaching that big number—I have no reason to doubt. Whipple and Fiore told me the boat felt rock solid at that speed, I have no reason to doubt that, either. It certainly felt that way at 130 mph. As for handling, the SV 43 displayed impeccable manners at all times. 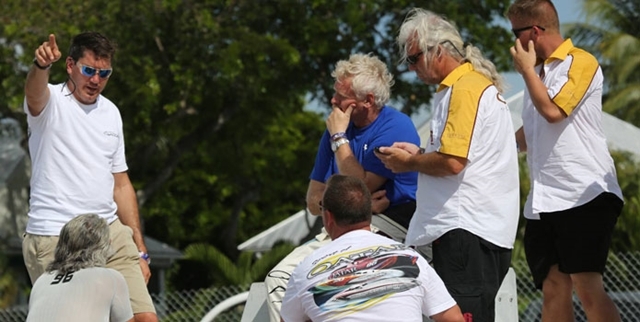 Without question, it helps to have someone of Fiore’s extensive experience doing the driving. But in sweeping turns at more than 100 mph, the stepped hull boat never bobbled. 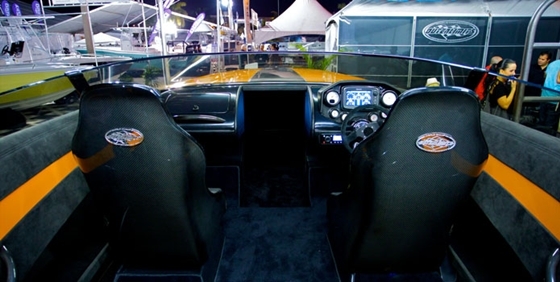 Forward visibility from the cockpit—as with all sit-down cockpit boats—is somewhat limited until the boat comes on plane. To its credit, the 43-footer’s low-profile deck definitely makes the forward view at idle speed better than average, such as “average” exists in this upper echelon of go-fast boat. 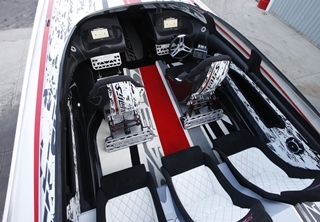 Still, a one-of-a-kind V-bottom with such performance capabilities pretty much begs to be seen by the go-fast boating public, and to that end the 43-footer will run in several events this season, including Desert Storm on Lake Havasu in Arizona and the Big Cat Poker Run on the Sacramento River Delta in California. 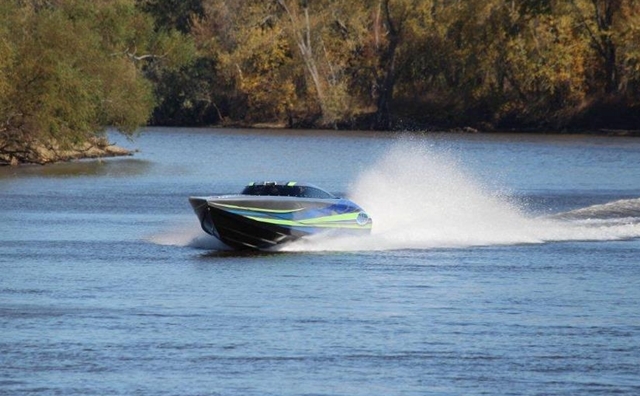 But the showcase event for the 43-footer this year will be the Lake of the Ozarks Shootout in Missouri, where a 52-foot Outerlimits reached 150 mph last year. With Fiore doing the driving, just as he did in the 2013, the plan is to go even faster in Whipple’s dream machine. Firsthand words to the wise: Don’t blink as this beauty goes by or you’ll miss it. And you really don’t want to miss it. 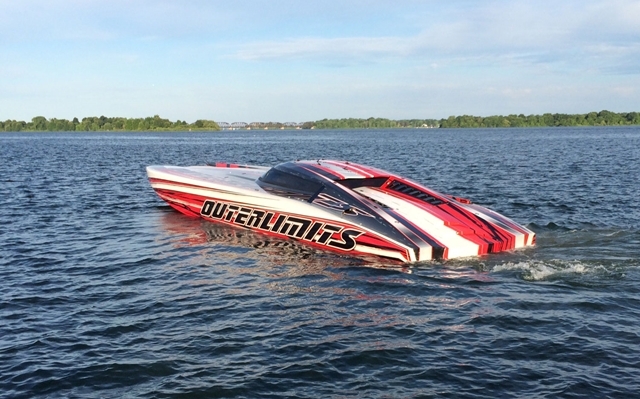 For more information, contact Outerlimits Offshore Powerboats.